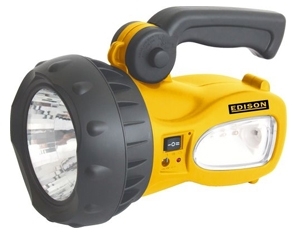 2 million candle power LED rechargeable spotlight. Super bright one watt LED light. Side LED tube light. Two position handle, to ensure comfortable and ergonomic access. Swivel handle. 6V 4Ah sealed lead acid battery. Supplied with AC/DC mains charger and 12V DC car plug adaptor for portable charging. · Main spot light up to 6 hours. · Side LED tube light up to 70 hours. Main spot light 2 million candle power up to 6 hours. Side LED tube light up to 70 hours. Supplied with AC/DC mains charger and 12V DC car plug adaptor for portable charging.